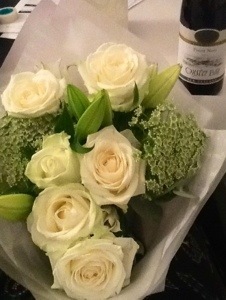 I was given flowers and wine at work recently for finishing a huge project. I scheduled the Undergraduate Course Offerings and created the London Undergraduate Course Catalogue for the full 2014-15 Academic Year. That worked out to be about 80 courses in Fall 2014, 80 courses in Winter 2015, 45 courses in Spring 2015, and course options for Summers one and two 2015. The Course Catalogue was released to all students. Then we opened Online Registration. This was the first time our students registered for the full academic year. And it went well. I think about 90% of the students have registered for next year. I also trained the new San Francisco Undergraduate Registrar, who came over to join us for two weeks. Where I explain my lifestyle choices and give tips. A friend recently asked me how I manage working full-time and doing film stuff in my spare time. He got his first full-time office job recently, and has been struggling with having the energy to do anything else. Where I’m a glutton for busy-ness and stress, and get to be in on making two short films in as many weeks. Sound editing for this competition. Author phetheringtonnzPosted on September 20, 2012 Categories Blog, filmTags 48 hour film, Bellydance, busy, film competition, Filmmaking, Globe Theatre, London, shimmy in the city, Short film, stress, Taming Of The Shrew1 Comment on Did I mention I was busy? Assorted things, but really I’m just busy editing and trying to clear my plate. Apologies if you haven’t heard from me lately. I’ve been working on finishing two projects and getting them out. All of my spare time is going into these projects. I think that’s a good thing. Nothing clears the head like clearing what has been stressing you out.